BJP’s lone legislator from Chhattisgarh’s Maoist-affected Bastar region, Bhima Mandavi, was killed along with four policemen on Tuesday evening as Maoists carried out a deadly attack on his convoy in a forested patch in Dantewada district. The brutal killing of India’s ruling party’s MLA created outrage in Chhattisgarh as Chief Minister Bhupesh Baghel cancelled his poll campaign and chaired a high-level meeting in Raipur to assess the law and order situation. Baghel, who is facing flak for allegedly adopting a soft approach towards Maoists, said he was “deeply disturbed” by the killings, but also defended his government’s measures. Dantewada is part of Bastar Lok Sabha seat that goes to the polls in the first phase on Thursday, April 11. Bastar is considered the Bharatiya Janata Party’s bastion as the party has been winning the seat since 1999 with massive margins. Police said that the attack – the second one in April after a Central Reserve Police Force (CRPF) trooper was killed on April 5 and another injured in a gun battle with the Maoists in the state’s Dhamtari district — was “meticulously-planned”. “It was a meticulously-planned attack, Maoists specifically targeted BJP MLA’s vehicle when he was rushing to Nakulnar to address a public meeting in favour of the BJP candidate from Bastar seat Baidu Ram Kashyap in closing minutes of poll campaigning,” Dantewada police chief Abhishek Pallav told reporters at the blast site. 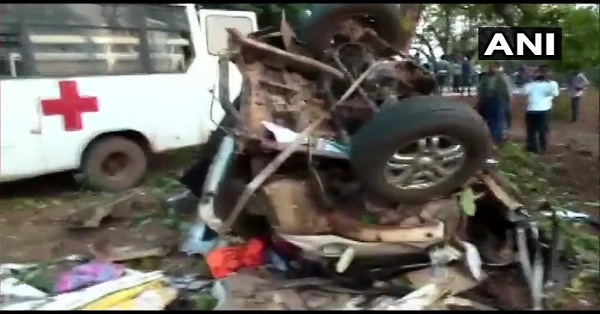 He added that Mandavi’s driver and three PSOs were also killed in the blast that tossed the 40-year-old BJP leader’s vehicle several feet up in the air before it landed and broke into pieces. The body parts of all the deceased were found scattered at the attack site. The Election Commission said that as polling in the state’s Maoist-affected districts is scheduled during the first and second phase on April 11 and 18, all measures would be taken till polling is concluded in these two phases. “Chief Electoral Officer of Chhattisgarh took an immediate video conference of collectors and other poll staff of the affected districts covering phase 1 and phase 2 in Chhattisgarh, and instructed them to take all precautions over the next few days till the polling is complete,” an EC official said.